Today Century Cycles owner Scott Cowan was the featured speaker at the luncheon meeting of the Olmsted Falls/North Olmsted/Fairview Park Chambers of Commerce, sharing his insights on growing and marketing a successful business. This blog even got a shout-out in his presentation, cited as one of the integral components in Century Cycles online marketing efforts. 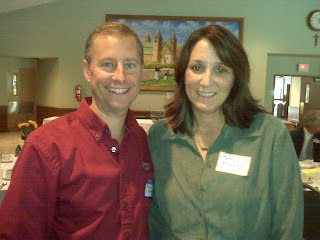 Thanks to Terri Mrosko of Enhanced Communications (above with Scott), a Board member of the Olmsted Falls Chamber of Commerce who hosted Scott as a guest and coordinated his appearance, as well as all three chambers for their warm welcome, Donauschwaben for the delicious lunch, and the owners of The Olde Wine Cellar and Olmsted Auto Care for their hospitality.